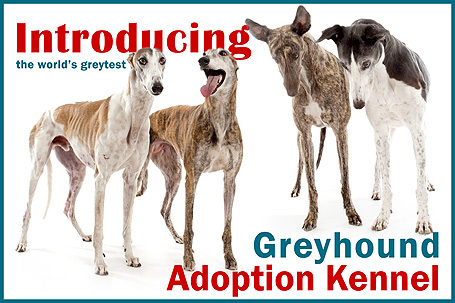 National Greyhound Adoption Program’s new kennel facility has been in the works for many years; over three years of planning and two years of construction! It has many innovative features that make for an enormous degree of comfort for the greyhounds that are lucky enough to be kenneled with us. 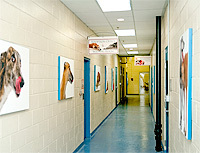 Our entrance hallway is adorned with beautiful, large-scale greyhound photographs. All of the photography was done in-house in our own photo studio and printed in-house on our own state-of-the-art six-color printer. You have to be up close to truly appreciate the fine detail and expression of each dog. Look up and you will get the sense that you are still outside! All of our light panels are superimposed with clouds in the sky! Many guests will come to walk dogs, board their greyhounds or utilize our clinic and our large custom-made hanging signs direct you to the right place. Soft music resonates through our entire kennel thanks to our 300 cd changer – my kind of music! All of our countertops are granite, the cabinetry is all metal, and greyhound pictures decorate all of the walls. You will note that everything is color-coordinated from the blue canopies outside the building to the blue floors, to the blue doors and the blue walls. Everything matches so well! 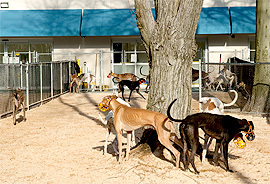 We have large runs for each of our greyhounds which are segregated into five different kennel sections. Each run measures 52” wide x 79” deep. Each run also has a raised floor consisting of a rubber-coated metal grid with a rubber woven mat on top which makes the floor a very comfortable place to lie! Of course, our greyhounds need only move to the rear of their run and take one step up to find their own large soft bed. Each dog finds its own position to get comfortable in and truly relaxes. If you walk into our kennel during quiet time you could hear a pin drop. Although trench drains run continuously under all of our runs in the event that one of our greyhounds relieves itself inside, our greyhounds go outside for exercise and fresh air five times each day; twice in the morning, twice in the afternoon and once in the late evening. 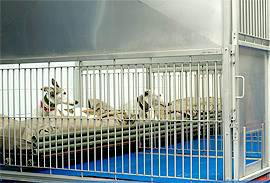 Each kennel section is accessible to the outdoor entrance area through 8’ sliding glass doors. Each door has translucent frosting from the bottom of the door to approximately the middle of the door with the outline of three racing greyhounds. Because of this frosting, none of our dogs have yet to accidentally run through or into any of the doors and it allows us to see on both sides. Because these doors are directly in front of our yard entrance doors, they bring in much light during the day. Our dogs are let outside into one of our four yards through hand-operated automatic sliding doors. They can run as much as they like at their own option and sometimes, they even still look like racers darting back and forth together! Every yard begins with a pitched concrete pad, complete with trench drain, but the rest of the 150-foot-long run consists of sand. Most of the sand is left behind on the concrete before they re-enter the building. Clean-up is not difficult at all as each yard has its own hose reel and is hosed as needed. Kennel floors are hosed, squeegeed and mopped during each shift. 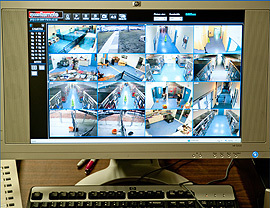 NGAP has three working shifts; 6:00am-11:00am, 1:30pm-5:00pm and 8:30pm-10:00pm. The in-between times are referred to as ‘quiet times’, when the dogs are able to truly rest. 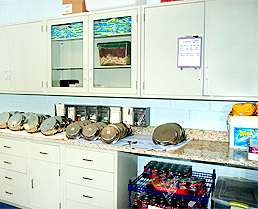 We have two feeding stations, one for boarding and a much larger one for the kennel areas. All of our feeding stations have granite countertops and plenty of cabinetry, both under the counters as well as on the walls. As you pass through the rear of the kennel area on the left hand side you will find the dental room. 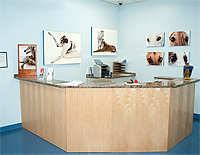 This room is primarily used for light dentistry, nail clipping and ear cleaning for our boarders. It has an anesthesia machine available if needed and can be also used for treating any minor cuts and bruises that may occur. Behind the kennels are three interior turnout areas measuring approximately 14’ x16’. If the dogs cannot go outdoors for some reason, they can be turned out inside the building. If necessary all of our dogs can use this turnout. Our interior turnout area is lit primarily by four ‘sun tubes’ as opposed to electrical lighting. These sun tubes are actually glass tubes 14” in diameter that run from our ceiling up to the roof and allow enough sufficient natural lighting without any use of electricity. 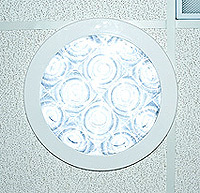 This lighting is also used in our bathing and laundry area as well as across our main hallway in our post-op area. Post-op consists of ten cages with raised floors that are smaller than our regular runs since they not meant to be permanent living quarters. Behind post-op, we have an isolation room with two cages. Wherever you go in our kennel, be sure to smile, because there are twenty-six cameras strategically placed recording kennel activities which are available to view online at all times. This is for the safety of the dogs as well as our staff. Everything is recorded and available for review. Much consideration was put into the design of the ventilation system for our kennel and surgical facilities at National Greyhound Adoption Program. 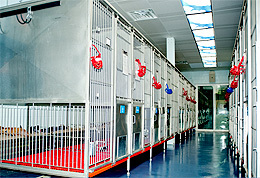 Our kennel is divided into five sections, each with its own independent HVAC system and separated with double steel doors. Each kennel has a dehumidifier and thermostat and maintain a temperature of about 73-74° year round. As part of the installation of the HVAC, we added a standard filter with a hepa filter above it. We also have filters in the master unit on the roof. Two parts of our new surgical facility have already been completed. 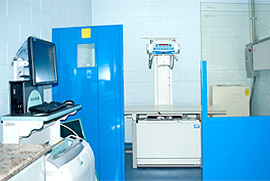 One is our new x-ray room with our new Fuji CR Digital Processor. It’s a well-lit room since we no longer need it darkened for x-rays. The digital processor gives us abilities in x-ray work not formerly imagined. Images can be sent directly to a surgical area or examination room as well as burned onto a CD for a client. 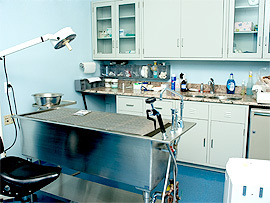 The other is our surgical pack preparation room complete with two large autoclaves.